Seneca III — at 2301 hours BST no longer in a Middle England this dark 12th day of April 2019. This entry was posted in Civil Liberties, Europe, Legal action, News, Politics, Treason, UK by Baron Bodissey. Bookmark the permalink. I wonder what the few remaining WWII combat veterans think about this. Facing the horrors of the Nazis just to hand the keys to the kingdom to barbarians from the seventh century. It ‘ain’t’ over yet! I am glad the population can now see the EU and the Globalists for what they are! The more they double-down to use an American slang expression, the worse their situation in power will become. It may not be immediate but a response is coming! I can feel it. Even “Remainers” I know have now seen the totalitarians for what they are…. The EU and its simpering furtive dribbling atheist wimps are on the wrong side of history. We can win this and let it be a warning to future generations of self-servers as to what loss of freedom entails. Islam is a problem but there are ways to deal with that too. Christian Europeans are now outbreeding the dribblers and the Moslems are not having as many children as the BBC and others like to suggest. Many are converting to Christ too! I know because of the position I am in- I see it weekly. And I am no Lefty either but the future looks far brighter than it did. We may not have Yellow Vests on the street in large numbers yet- that is not our English way but the behaviour of those like Gina Millar and others has actually assisted the very cause they hope to stop. Even Blair has changed his tune- he usually drifts with the wind, as does Corbyn. It is only power that interests these Marxists. Blair is far more intelligent than Corbyn and pragmatic. I like neither. We are dealing with opportunists and even they cannot “Live by bread alone!” Te last thing we need and want is a violent civil war. The criminals in the Banks and Deep State would love that! No we’ll solve this another way. I wish you wouldn’t use “atheist” as a perjorative, Bishop; it’s condescending, to say the least. I for one would love to have a spiritual sense (beyond what I get from Bach and Beethoven), but even if I did, I’d find the Christian message (God sacificing his son to redeem humans whom he’d created imperfect in the first place) implausible. My father is one of those veterans, 95 this year. Landed near Caen one day after D Day then fought his way through France, Holland and Germany. What does he think? “Britain could not possibly be worse than it is now had Germany won the war.” He should not have to worry about his children, grand children, and great grand children, but he does. A curse on Britain’s ruling class. One of the saddest things I’ve ever read. Here’s a tale of Quisling traitors, sold their country to invaders. The first was shot in forty-five, but many more are still alive. When was there a referendum, ere our traitors thought to send ’em? 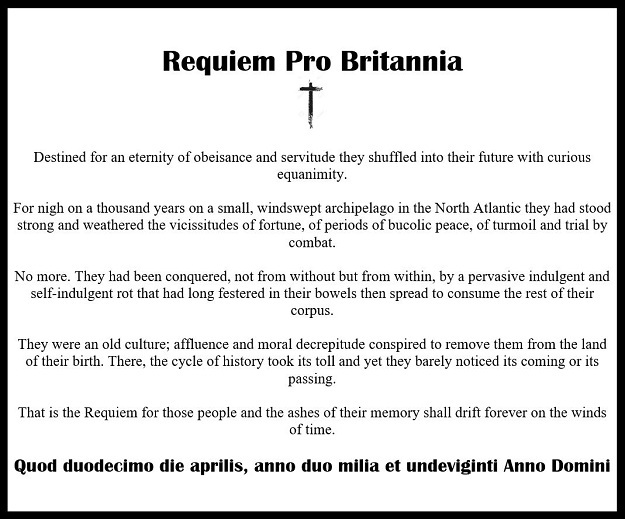 Rivers of blood would be the cost, Enoch was right, now Britain’s lost. Bombs and bullets, acid and knives, vans on pavements destroying lives. While to jihadis flats are given, and ISIS killers all forgiven. Hitler’s Nazis could not manage, what our Quislings done in damage! Will saving Blighty come too late, before the Saxon learns to hate? 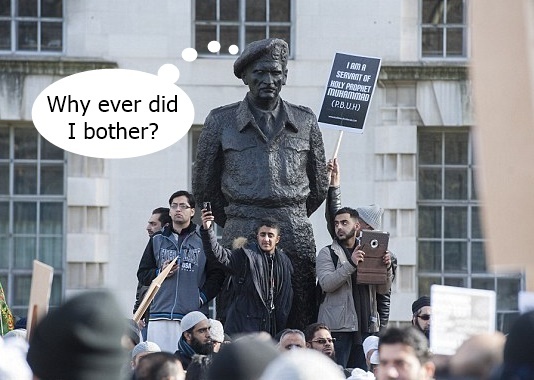 If saving’s coming, it can’t wait, or Islam will be Britain’s fate. Hmmmm….Chicken come home to roost….